Curie depth offers a valuable constraint on the thermal structure of the lithosphere, based on its interpretation as the depth to 580°C, but current methods underestimate the range of uncertainty. We formulate the estimation of Curie depth within a Bayesian framework to quantify its uncertainty across the British Isles. Uncertainty increases exponentially with Curie depth but this can be moderated by increasing the size of the spatial window taken from the magnetic anomaly. The choice of window size needed to resolve the magnetic thickness is often ambiguous, but based on our chosen spectral method, we determine that significant gains in precision can be obtained with windows sizes 15–30 times larger than the deepest magnetic source. Our Curie depth map of the British Isles includes a combination of window sizes: smaller windows are used where the magnetic base is shallow to resolve small-scale features, and larger window sizes are used where the magnetic base is deep in order to improve precision. On average, the Curie depth increases from Laurentian crust (22.2 ± 5.3 km) to Avalonian crust (31.2 ± 9.2 km). The temperature distribution in the crust, and associated uncertainty, was simulated from the ensemble of Curie depth realisations assigned to a lower thermal boundary condition of a crustal model (sedimentary thickness, Moho depth, heat production, thermal conductivity), constructed from various geophysical and geochemical data sets. The uncertainty of the simulated heat flow field substantially increases from ± 10 mW/m² for shallow Curie depths ~ 15 km to ± 80 mW/m² for Curie depths > 40 km. Surface heat flow observations are concordant with the simulated heat flow field except in regions that contain igneous bodies. 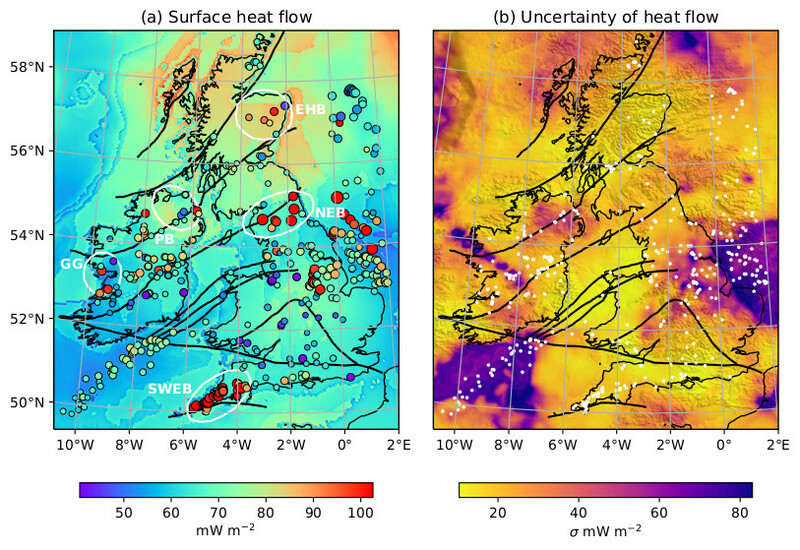 Heat flow data within large batholiths in the British Isles exceed the simulated heat flow by ∼ 25 mW/m² as a result of their high rates of heat production (4–6 μW/m³). Conversely, heat refraction around thermally resistive mafic volcanics and thick sedimentary layers induce a negative heat flow misfit of a similar magnitude. A northward thinning of the lithosphere is supported by shallower Curie depths on the northern side of the Iapetus Suture, which separates Laurentian and Avalonian terranes. Cenozoic volcanism in Northern Britain and Ireland has previously been attributed to a lateral branch of the proto-Icelandic mantle plume. Our results show that high surface heat flow (> 90 mW/m²) and shallow Curie depth (∼ 15 km) occur within the same region, which supports the hypothesis that lithospheric thinning occurred due to the influence of a mantle plume. That the uncertainty is only ± 3–8 km in this region, demonstrates that Curie depths are more reliable in hotter regions of the crust where the magnetic base is shallow.